This "Toyota Supra" is more a BMW than it is a Toyota. Its pretty much a BMW Z5 reskin with a Toyota Supra badge. I wonder how will this sell considering there's nothing Toyota about it. I honestly feel like its insulting the Supra name. I'll wait and see but I have similar thoughts. Did this project come about because of a drunken bet or something? I don't think if it has a cast iron block that it is going to weigh 3100lbs unless they are using a lot of aluminum and carbon fiber and it sounds hard to believe it will have its own unique iron block while BMW is aluminum. BTW this thing is reall small ! Last edited by RNM GS3; 07-12-18 at 10:46 PM. My friend it’s getting an iron block inline 6 - thats as Supra as you can get! The car will weigh 3100 lbs and has some meaty tires.....255 front and 275 rears. It’s supposedly has CF roof and other CF components. This thing is SMALLER than FRS/BRZ. Priced at $65k for 2seater will be tough. It needs to be make great power and have tune potential to get a following. That maybe so. But overall there is nothing Toyota about it. This thing supposedly have a BMW Engine, BMW transmission, BMW interior + iDrive, BMW Chassis, and its made in Austria. Only thing Japanese or Toyota Supra about it is the name and design. I agree with your last bit. If the 65K rumors are true, it'll be a tough sell. Not sure how much people will shell 65K for a Toyota (with a BMW engine) - when you can get a BMW M2 CS for less money. Definitely. I'll wait and see too. I just think its quite strange. I'm one of those folks that wished Toyota would have gave the Supra a Lexus treatment or or something. Maybe a TTV6, Lexus interior, and etc... I had my eyes on this Toyota Supra. If rumors hold true and its more BMW than Toyota, I'll pass on it. To be honest - I'll drive a BMW M2 CS before I'll drive a Toyota Supra with a BMW engine. My dream MKV Supra would be a newer version of the 2jzgte but with a 3.2L at least and factory single turbo with 6MT and DCT transmission option. 450 base HP from factory with iron block and no more than 3250 lbs. I would care less about how it looks can look exactly like above and no more than $75K and Hardtop only option. Again my dream MKV Supra. 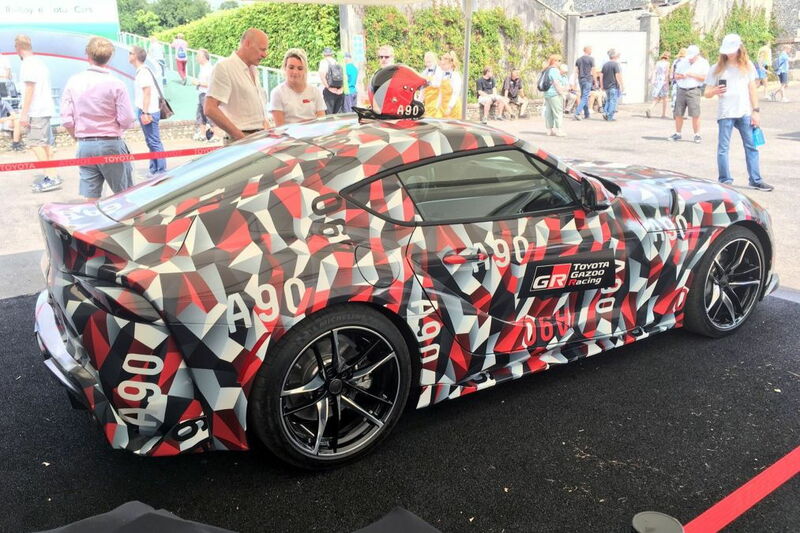 I think for the most part nobody is thrilled with this new Supra. The hype and long delayed intro of bringing this thing to market is not helping. Besides that it uses mostly BMW parts and hardware - the other sad thing is that all the vents/scoops in front bumper, hood, sides and rear are FAKE. Even Mustangs have gotten rid of the fake aero lol. Really not sure what Toyota is thinking. Personally I was really down on this car especially that it would not offer a Manual. The news of the iron block, CF parts, and really wide tires on such a tiny car his piqued my interest again. One thing for sure it will not be cheap. Last edited by RNM GS3; 07-13-18 at 06:31 AM. Yes. This Supra's return is so long and drawn out it's exhausting. I wonder if this is Toyota's plan. To purposely disappoint all 10 people that's still screaming to buy a new Supra so they can stop complaining and Toyota will no longer have to do another Supra, cuz you know poor sales. Agreed at $65k this will be a total fail. Too many BMW badge snobs will turn their heads at this, why buy a $65k Toyota when you can buy a $40k M240i that has the same HP? Interesting comments, but as former owner of 2 Supra TTs, one thing that isn't being mentioned is that the MKIV TT in base form was just OK back in it debut. It's 0-60 times were in low to mid 5's and 1/4 mi in the low 13s (depending on which mag you believe). What made it legendary was it's tunability and reliability of the stock block to handle tons of power. If it's 3100lbs is true, thats pretty significant in this day and age over overbloated sports cars. And although its stock output may just be ok, I think the acceleration times will best anything Toyota has today (I know, that's not saying much), with the aftermarket filling any needs an owner may want power wise. No Z4 will not have the iron block just regular B58 6cyl and obviously the 4cyl. Not accurate - MKIV when it debuted in early 90s was one of the fastest cars you can buy and definitely faster than all of its direct competition. The 320hp rating was BS as it made more than that at the wheels stock. Which unfortunately ruin its proportions and its stance.